Shares of both have been beaten up lately. Which is the better bet? As investors, we tend to focus on the future. After all, our portfolios reflect how we see the future playing out in various parts of the economy. 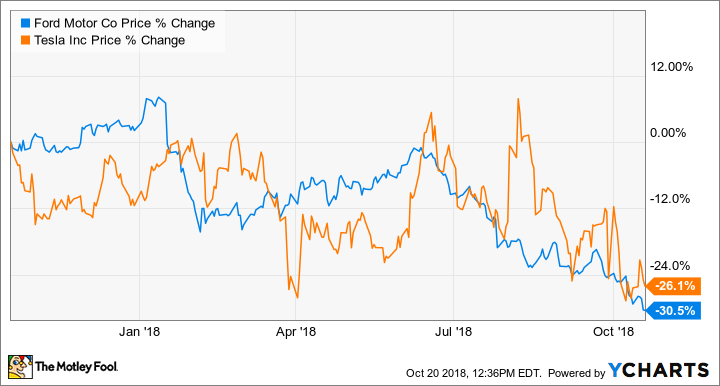 Given that future focus, a comparison between Tesla (NASDAQ:TSLA) and Ford Motor Company (NYSE:F) might seem strange. After all, Tesla is the future and Ford is the past -- aren't they? The truth is, it's not quite so simple. With both companies' stocks down significantly over the last year, it's a good time to take a closer look: Which is the better buy for new money right now? Tesla's fans love the Model 3. But a too-ambitious manufacturing plan for the Model 3 has cost Tesla dearly over the last year. Image source: Tesla Inc. Neither Ford nor Tesla has had a great year in the stock market. Through last Friday, both were down over 25% in the last year, with Ford down a bit more. F data by YCharts. Chart shows the performance of Ford and Tesla stock over the year ended Oct. 19, 2018. The usual earnings-based valuation measures don't give us much to work with here. Ford is trading at about five times its trailing 12-month earnings, while Tesla is trading at roughly 21 times its per-share loss over the same period. The truth is, Ford and Tesla are different kinds of stocks. Ford is solidly profitable: It had net income of $7.6 billion in 2017, $4.6 billion in 2016, and $7.4 billion in 2015. Tesla isn't: While it has managed to eke out a quarterly profit here and there over its history, it has yet to report a full-year profit. The truth is, comparing these two companies on fundamentals is largely useless, because Tesla's valuation isn't about fundamentals -- it's about the story. Does Tesla's story still support its valuation? Tesla has had one of the all-time great stories. As fans have seen it, CEO Elon Musk is inventing the future -- not just of cars, but of energy -- right before our eyes. In the minds of those fans, Tesla's growth potential has seemed unlimited. That's not an exaggeration. About a year and a half ago, Morgan Stanley analyst Adam Jonas released a note that estimated Tesla's eventual total addressable market at $15 trillion -- or about a fifth of the entire world's gross domestic product. It's no wonder Tesla's market cap hit $60 billion in June 2017, about one and a half times Ford's at that same moment. But Tesla's story has hit some speed bumps in the last year. Tesla struggled mightily to get its Model 3 sedan, its long-promised "mass-market" model, into full production, installing and then partially ripping out a highly automated production line. Ongoing concerns about build quality, a long list of executive departures, and Tesla's diminishing cash reserves haven't helped investor confidence. When a frustrated Musk tweeted in August that he had "funding secured" to take the company private, only to see the deal (if there ever was one) evaporate in the days that followed, it seemed like the company's wheels might be coming off. It's possible that Tesla managed to eke out another small profit in the third quarter by delivering mostly loaded high-margin versions of the Model 3. It's also possible that it will report a fairly healthy cash balance as of the end of the period, as it appeared to be timing payments to maximize its cash on the last day of the quarter. And it's possible that those things will give Tesla's stock price a boost, at least for a little while. But the story has worn thin. More to the point, Tesla's margin for error appears thinner now than it has in years. There's a strong case to be made that despite its 26% stock price plunge over the last year, Tesla is still overvalued. Ford's story starts with the super-profitable F-Series pickup, of course. But Ford is investing heavily in electric vehicles and self-driving technology, too. Image source: Ford Motor Company. Ford is struggling a bit, at least by its own recent standards, but it's not in any kind of serious danger. Simply put, Ford's sales and margins have slipped over the last several quarters as its product line has aged. That's a problem that can be solved by launching fresh new products. Ford has a slew of new models on the way, including all-new versions of its big-selling Escape and Explorer crossover SUVs and the return of the Ranger midsize pickup to the U.S. lineup. CEO Jim Hackett is also making a number of other changes intended to maximize the profitability of Ford's traditional business lines while it invests aggressively in new technologies and explores new mobility-related business models. There's one other thing to note. Ford may not have Tesla's growth story, but it has something a bit more concrete going for it: a dividend, yielding about 6.8% at current prices. While high-dividend yields are often a caution sign, because companies in trouble tend to cut dividends early, there are good reasons to believe that Ford will be both willing and able to sustain its quarterly dividend at current levels even through a recession, when its profits (and share price) might well get squeezed. Is Tesla or Ford the better buy now? By now, you probably know how I'm inclined to answer that question. I think that for a patient investor, Ford is a good bet for substantial share-price growth from here over the next five to seven years or so. I own Ford stock and have no plans to sell. As for Tesla, it really depends on how you feel about the story. I have never believed the more outlandish predictions for Tesla, but I have long felt that the company had a chance to become roughly BMW-sized, selling maybe 2 million to 3 million premium vehicles a year at good margins. There's still a chance that could happen, in which case Tesla's stock might be worth (on fundamentals) something like what it's selling for now. But there's also a chance it could drop sharply from here if the company is forced to restructure or recapitalize -- possibilities that look a lot more likely now than they did a couple of years ago. It's true that Tesla's stock could easily run up to $350 again in a flash, or even higher. It might make a fun trade, if you're inclined that way. But as a long-term investment, I think there's a lot of risk to Tesla now that maybe wasn't easily visible a year or two ago, and that's why I think Ford is the better buy today.